A helicopter is a collection of rapidly moving parts, all going in different directions in close proximity to each other. Like the commercial for dating bliss implies, testing the harmonious relationship of these parts helps to keep them together. 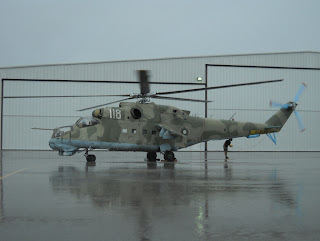 It was a dark and rainy day but our intrepid crew had a schedule to keep. 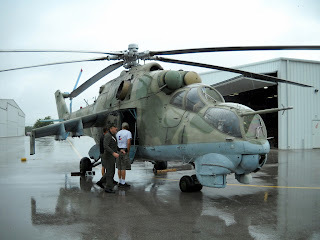 After wiring the Cold War Air Museum, Mi-24 with sensors they reviewed their work plan. Electronic sensors help identify exact problems and adjustments necessary to fix them. In addition to the maintenance benefit, every improvement in vibration is directly appreciated by the crew's arse and eyeballs.